Our large capacity storage tanks are ideal for firefighter tanks ready to be used at any time if a fire occurs on your premises. 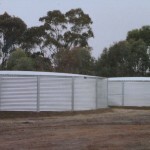 These tanks are constructed away from industrial buildings and designed to be ready for use for any emergency. They have increased water volume through the large outlets and overflows that can be sized up to 250mm and come with the Storz fire connection. The inside walls of our tanks are lined with Geotex so the Polyethylene liner is fully protected from contact with the galvanised sheeting and better able to withstand heat from the sun or grass fires.